ClickUp is an intuitive project management software that helps teams of all sizes to take care of tasks and workflows efficiently. 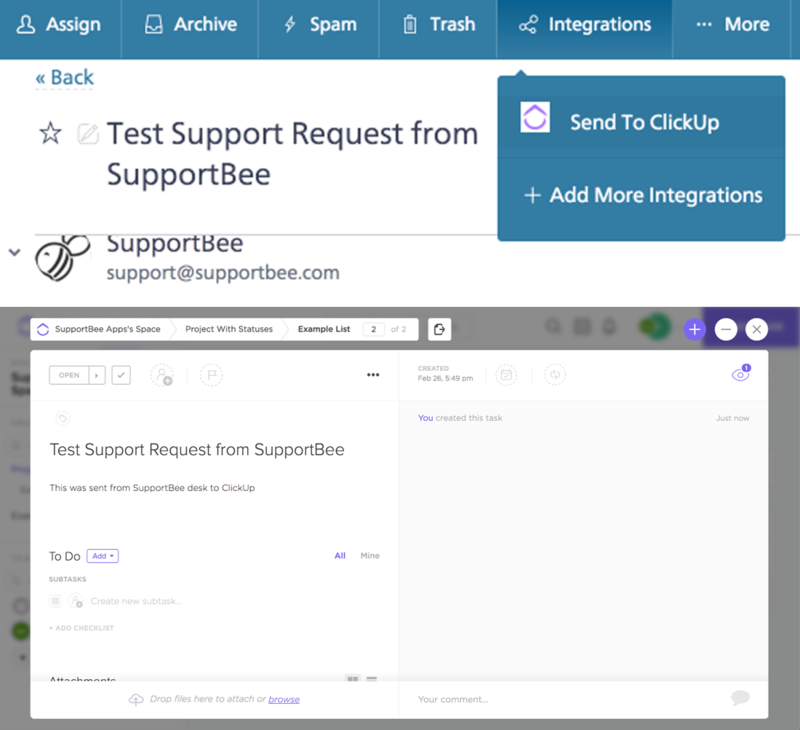 SupportBee now integrates with ClickUp to help users manage their tasks, and projects better. If you are a ClickUp user, SupportBee’s integration with ClickUp will help you create tasks right from SupportBee. To send any of your customer tickets to ClickUp, open the ticket in SupportBee, and click on Integrations > Send To ClickUp. You can choose the team, project or space in ClickUp before clicking on ‘Send’. Once you send the ticket to ClickUp, we automatically post a comment in the ticket thread with the link to the task in ClickUp. Similarly, a link to the SupportBee ticket is added to the ClickUp task to let your users have the ability to navigate between apps easily. To add the integration to your SupportBee account, click on the 'Add to My SupportBee' button in our integrations page. You'll be taken to ClickUp so you can grant access. You can choose the 'Teams' to which you want to grant access to SupportBee. Once you have selected the 'Teams', you will be redirected to the integration's ‘Settings’ page in SupportBee. As always, if you have any feedback, don’t hesitate to leave a comment or send an email to support@supportbee.com.